Well, B&Q did have a rotary cutter (in the wallpaper aisle) and it was three quid, as it turned out. 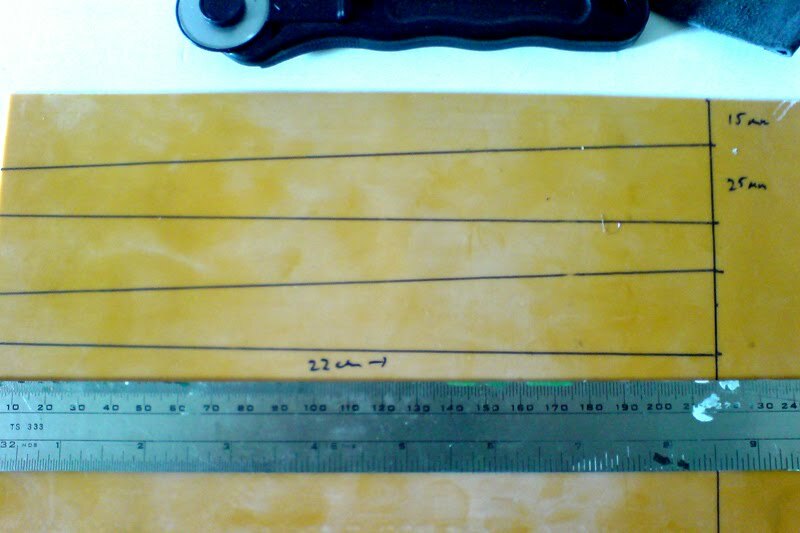 I marked up the elastic, as below, 4 strips - since I'm going to use the bands doubled - 22cm in length and each one tapering from 25 to 15mm. Attaching the bands to the catty using the 'over the top' method (since the doubled bands wouldn't go through the small holes in the arms of the catty) was easy. I secured the bands with another very thin strip of Theraband wound round many times and then tucked under itself. I did the tuck by winding the last of the elastic over the ends of some long-nosed pliers then wrapping it round again before grabbing the very end of the strip with the pliers and then pulling them out from under the bands - thus trapping the end very tightly. I used the same method to attach the bands to the pouch. A few snips with the scissors to trim and bingo: Tidy! A few test pulls reveal that this set up is frighteningly powerful compared to the - I now see - extremely weedy square profile elastic that the catty came with. Just in case you haven't seen this -- you must. Hubert- I expect wood pigeon post haste with that rig! 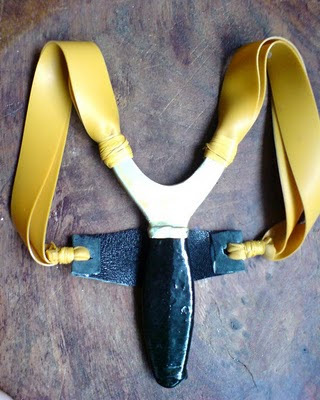 I must admit I hadn't used a catapault (slingshot in the States) since I was a child. I think one of these might be the ticket for road-grazing grouse however.